Your family's monthly house chores list is sure to be very different from my family's list. Your list will differ depending on many factors, such as how many kids you have and how old they are, the layout of your home, whether or not you have pets, where you live, how much (or how little) your family is home, and how meticulous you and the family intend to be with your housekeeping routine. But to give you a guide to create your own chores list, I'd like to offer you mine! The age recommendations are just that, recommendations. Your tidy 11-year-old who has been cleaning his room since age 2 can probably tackle some of the chores listed for teenagers if safety isn't an issue. 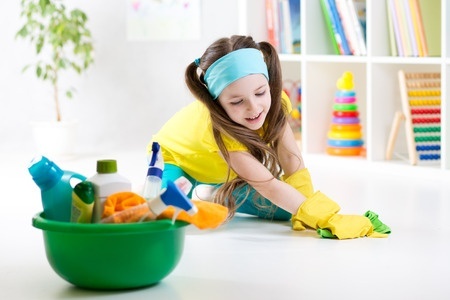 Conversely, if you've been the maid for your 13-year-old since she was born, you might have to start her off with some of the simpler chores recommended for younger children. Once a child reaches a certain skill or age level, he can generally do the chores for his age group and those for the age groups below. This is the monthly house chores schedule that works best for me. Sweep the garage floor with a push broom.